It was believed that humans first began consuming cacao in Mesoamerica approximately 3,500 years ago. But a recent discovery made in burial grounds in the South Ecuadorian region known as Mayo-Chinchipe has uncovered pottery dating back 5,400 years that contains fragments of chocolate DNA. 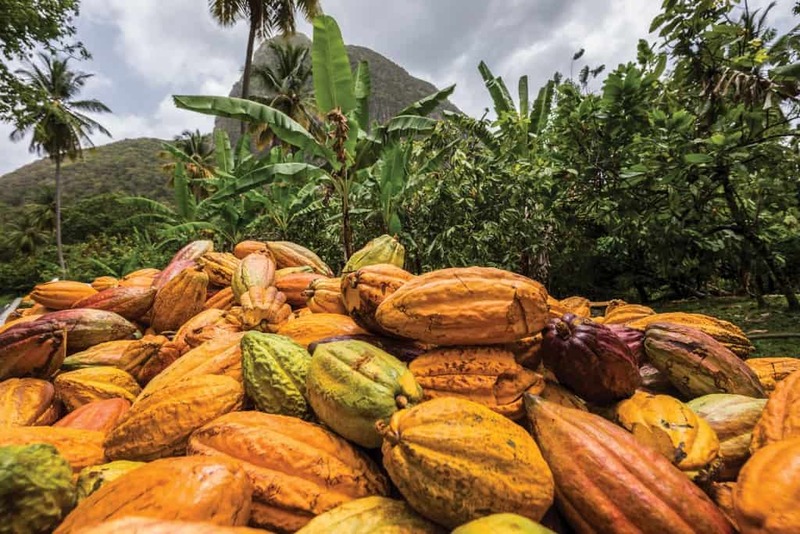 This news confirms suspicions that Theobroma cacao (the official name of the cocoa tree) was indeed domesticated and consumed in South America prior to its migration into Mesoamerica (what is now known as Central America and Mexico.) How exciting for Ecuador, as there is such tremendous chocolate now being made in this South American country–primarily from Nacional cocoa beans–thought by many to be the finest cocoa in the world. 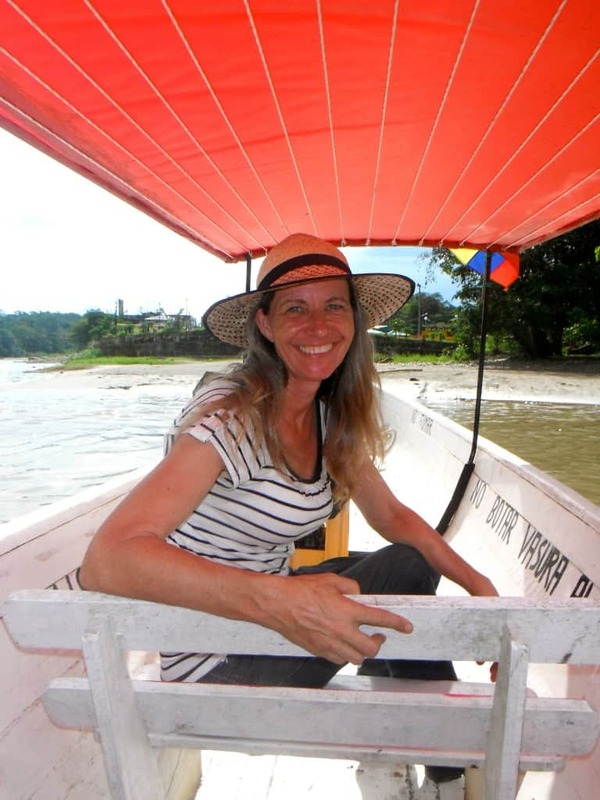 I first met Elizabeth Hendley, a fellow Canadian originally from Ontario, Canada, in 2012, when she invited my friend and I to travel with her down the Napo River (an Amazon tributary) to her cacao plantation and lodge in Misahualli, Ecuador, to discover the excellence of Ecuadorian cocoa. I met Elizabeth Hendley–a Canadian who has grown cacao and championed the quality of Nacional cocoa more than anyone else I’ve ever met in my chocolate travels–when I visited her plantation and chocolate lodge back in 2012. It was through Elizabeth that I visited Kallari (run by the indigenous Kichwa people) and learned of Pacari (a socially responsible family-run business based in Quito,) two well-respected makers of award-winning Ecuadorian chocolate. You will find that cocoa tastes differently, depending where in the world it is grown. This is called the terroir of chocolate. Nacional cacao is one of the 10 major genetically different groups of cacao grown in the world and is found primarily in Ecuador. It was first thought there were only three main varietals of cacao. But recent research has now identified 10 strains. Amelonado is found in the Dominican Republic and grown by chocolate maker SPAGnVOLA. Marañón is the high grade cacao grown in the Eastern Andes region of Peru. Criollo is the premium varietal grown in much of Central America and Mexico. You may recall this post on the well-run Belcolade operation I visited in Tikul, Mexico, where Criollo is king. But I digress. The primary reason for this post is to celebrate one of the finest companies making chocolate in Ecuador, and to alert you to some of the other players in the country who are using the Nacional beans. It was interesting to see that my taste testers enjoyed the rustic stone ground chocolate even more than the silky smooth handcrafted Mindo bars. Up until recently, I didn’t think I was a huge fan of Ecuadorian cacao. There is no doubt that most of it is better than good, but Mindo Chocolate is great–at a very modest price. Mindo exclusively uses Nacional cocoa that is grown on family farms in the Mindo region northwest of Quito in the western Andes. (We were supposed to get there in 2012, but the roads had been washed out due to excessive rain.) Well, Mindo made its way to me in 2018, and I’m glad they did! The flavour of this chocolate is exquisite. 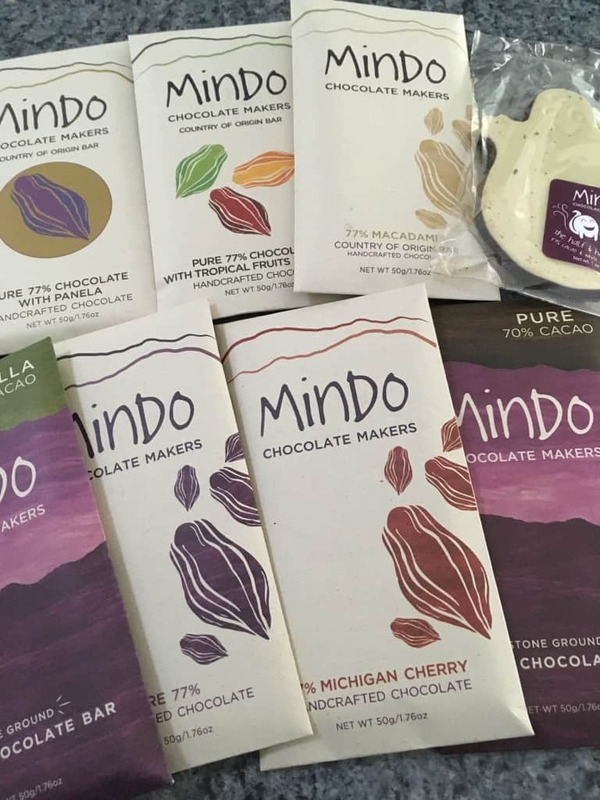 And Mindo Chocolate Makers show their skill at making both a rustic stone ground bar (carefully crafted at the chocolate studio in Dexter, Michigan, USA) and a super smooth series of single origin bars that are crafted right in Mindo, Ecuador, where the organic high-grade cocoa is grown. 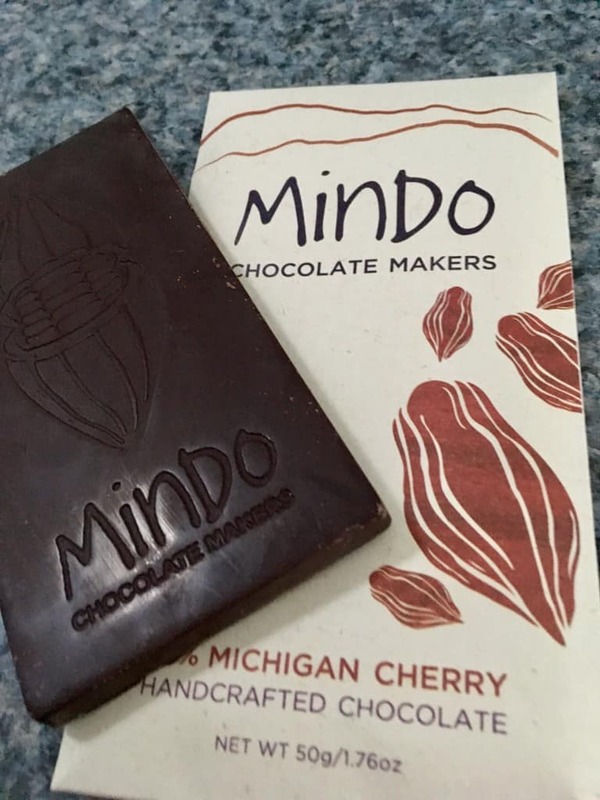 I love this Mindo bar with Michigan Cherries that celebrates the cocoa from their Ecuadorian home and the deep dark cherries grown near their American home. Another Ecuador-based company making chocolate from the locally grown Nacional beans is To’ak Chocolate. This is a luxury brand that is marketed in a very unique way. 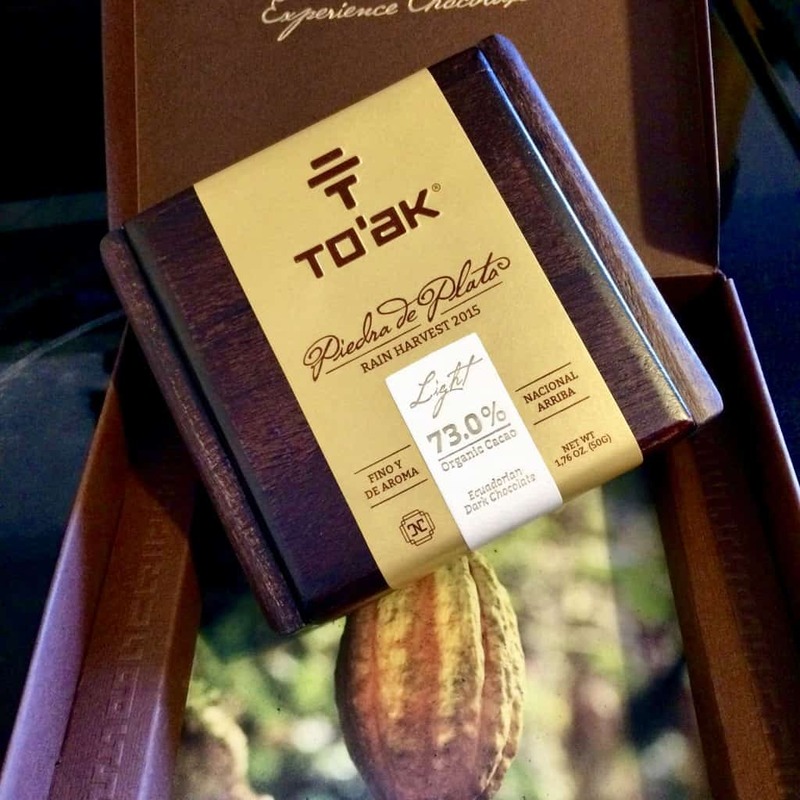 To’ak Chocolate comes in a box made of Spanish Elm, accompanied by a full-colour booklet that explains about Ecuador’s Arriba Nacional cacao, and what makes To’ak Chocolate unique. Nacional is the type of cacao. Arriba refers to the fact that the beans are grown in the in Piedra de Plata region of Ecuador. To’ak Chocolate from Ecuador is presented in a Spanish Elm box with wooden tweezers so that the oils from your fingers don’t alter the flavour of the chocolate. I really enjoyed the 73% ‘Light’ Rain Harvest chocolate made by To’ak. 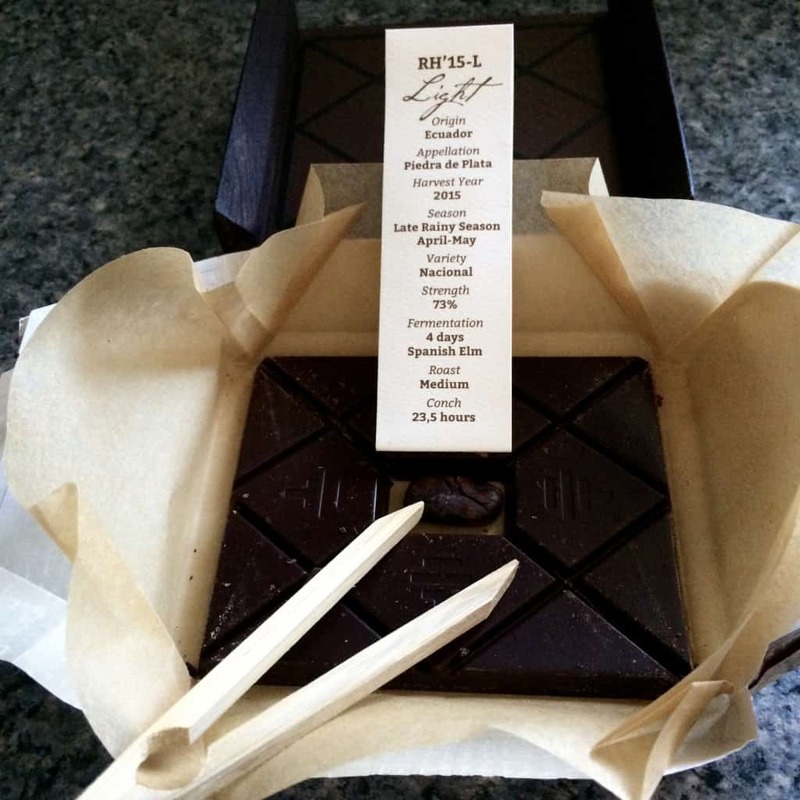 But is it worth $270 USD for the 50-gram tile of chocolate? Would you spend roughly $300 on a ‘chocolate experience’? Yes, To’ak makes good socially-responsible chocolate that is presented in a luxurious fashion. But only one percent of the sales are donated to the Ecuador-based rainforest conservation foundation–the Third Millennium Alliance. That does make me wonder where the remainder of the profits are going, as I believe that all of the other Ecuadorian chocolate companies I’ve mentioned also operate within the socially responsible sustainable model. I hope you’ve enjoyed this post about the various faces of chocolate in Ecuador. You decide which one is right for you. The wrappers on the Mindo chocolate bars are very impressive. If I saw one of theses bars in a store, I would buy it. Hi Bev and thx for your comment. You did eat some of the Mindo Chocolate (rustic style) at our Toastmasters event recently. What did you think of it? Doreen, you have once again piqued our interest with your look into Ecuador’s chocolate industry. It all looks so decadent and delicious. Thanks for sharing. Ooh I don’t think I’ve ever tried chocolate from Ecuador. Who’d have thought chocolate would have been around that long. Hi Lyn. Yes, it’s truly fascinating how evidence of cacao being used in South America 5,400 years ago can still be found today! Would Mindo be available in the US? Where and how can I try it? This also cements my plan to get to Ecuador! Hi Carol. Indeed, Mindo is available throughout the US. Just go to their website via the link in my post and you can order their bars. Be sure to try one of the rustic stone ground bars as the flavour is quite different than the more refined flavour you get in the pure bars made right in Ecuador. We did a taste test of Ecuador (75%) vs Madagascar (70%) last night and Ecuador came out the favourite, though Madagascar is extraordinary for its natural sweetness. Always fun and revelatory to taste them side by side. Indeed it its, Virginia. That’s why I really like Sirene out of Victoria, BC. They offer two-packs, where one half of the package offers a certain chocolate from one country, and the other half will offer the same % of cocoa from another country so that the chocolate lover can learn to appreciate the different flavour notes prominent in the different countries of origin. Tasting and eating chocolate has truly become a pastime for connoisseurs. I think Paola at the Candy Bar carries Sirene so I will check it out! Fabulous! I truly recommend the 65% dark milk combo from Sirene. It is amazing. In the years that I have known you and have followed your chocolate travels you have changed the chocolate experience for me. My favourites used to be overly sweet “candy bars” that I would pick up at the grocery check out. I now enjoy products with a much higher percentage of chocolate. Until I started to follow you I had no idea of the number of great products available. Besides the chocolate, the travel side of your stories makes me want to visit some of the great places that you have written about. l especially enjoyed the recent Cuba trip. You detailed a side of Cuba that those who just go to a resort would never experience. Doreen — you are not only a chocolate lover but a true scholar. I didn’t know about chocolate from Ecuador. It seems like great chocolate can be found everywhere, even in remote parts of the world. Interesting, informative article, Doreen. And “good on you” for questioning the possible lack of support of a socially responsible model . Thanks, Linda. It is never easy to do that. But I must call it like I see it. Cheers! I don’t think I’d pay $300 for the To’ak chocolate. But I’m very interested in the Mindo chocolate. Is it available anywhere in Canada? Hi Donna. I suggest getting in touch with Mindo via their website to see if they’ll ship to Canada. I definitely did enjoy this post about Ecuadorean chocolate. I’d love to visit Ecuador and try them in person. Thanks, Carole. Ecuador is an intriguing destination that is making great chocolate. Highly recommended! Chocolate is VERY much like wine, Karen. We even use the term terroir when speaking about chocolate origins, just as sommeliers do with wine. I loved the smooth taste of the Mindo Chocolate. Thanks for sharing your chocolate with us. What an intriguing story Doreen. I continue to learn so much about chocolate around the world from you. Ecuadorian chocolate with Michigan cherries, I have to try it! Thanks, Sue! glad you’re enjoying the virtual chocolate journeys with me. 🙂 Yes, you can order these bars from Mindo, and if you enjoy tart cherries, you’ll enjoy that bar. Do try one with just the plain dark chocolate as well. And the rustic ones are good, too! Especially for the very reasonable price. Your posts always having me sighing (and drooling) as I think, so much chocolate and so little time. . .so interesting this look at chocolate in Ecuador! Thanks, Jackie. It’s amazing how good chocolate is when it’s pure and created right at the source. What an interesting history lesson in chocolate I am getting through your posts! I’d love to taste this Ecuadorean chocolate. Was interesting to me to see that one of the labels is called “Michigan cherry.” Do you think the company really uses cherries from Michigan in the bars? Absolutely, Debbie, as the owners of Mind Chocolate live part-time in Dexter, Michigan and part-time in Mindo, Ecuador. I love learning that you’ve been on Amazonian water! I’d never spent that kind of $ on chocolate, so I’ll take your word for how good it is. That said, yet again you’ve given me another chocolate to watch out for! I never thought of chocolate having a DNA footprint. I’ve not seen the Mindo chocolate for sale here in Nova Scotia. I’ll have to be on the lookout. I’m surprised a company selling a $300.00 chocolate experience wouldn’t be donating more of their proceeds to a worthy cause. Sounds a little sketchy to me. Hi Nancie. No, I don’t think you’ll find Mindo Chocolate in Nova Scotia. But you can order it online. Definitely worth checking out. Great introduction to the many personalities of chocolate in Ecuador. As always, your photos and descriptions are totally tempting. So many of the Central and South American countries have amazing chocolate. Now I can add Ecuador to the list of places to go for the chocolate! You are right, Patti. Central and South America and much of the Caribbean are growing great cacao that is being crafted into amazing chocolate. Thanks very much. Travel is my primary passion and I love to discover new places I’ve not yet had the pleasure of visiting.